The Air Force has a program for enlisted members who want to earn a bachelor of science degree in nursing and become a commissioned officer. The program is called the Nurse Enlisted Commissioning Program, or NECP. Those selected for the program attend college full-time at an accredited college while remaining on active duty. It is a different program than Direct Enlistment Commissioning program, which lets airmen who already have a nursing degree and have passed the licensure exam to commission into the Nurse Corps. Selection boards for the program are conducted periodically. The first selection board was held at the Air Force Personnel Center at Randolph Air Force Base, Texas, in 2007. Applicants are required to attend school year-round in a resident-based program for up to 24 consecutive calendar months, to include summer sessions. It's an intensive program, and an applicant must meet a few requirements to be considered. He or she has to be active duty at level E-4 (Senior Airman) or higher, a U.S. citizen and be commissioned by age 42. Also, the applicant's physical and mental health must be such that he or she is "worldwide qualified," meaning they could be treated at any medical facility anywhere in the world. The Air Force regularly updates its list of disqualifying conditions for this status, so make sure you verify that you are eligible. Before being accepted into the program, candidates must complete 59 semester hours of college coursework from an accredited college or university. That coursework must include general psychology anatomy and physiology I and II including labs; microbiology including labs; chemistry I and II including labs; nutrition and statistics. Except for the labs, College Level Examination Program (CLEP) coursework is acceptable in lieu of college coursework for all these requirements. NECP candidates must also meet all prerequisites for an academic review and all the requirements for commissioning. Those selected will commission after passing the National Council Licensure Examination and then attend Commissioned Officer Training and the Nurse Transition Program. Students will be required to attend school year-round for up to 24 consecutive calendar months, to include summer sessions. As with a civilian nurse, there are many areas of specialization open to nurses in the Air Force. 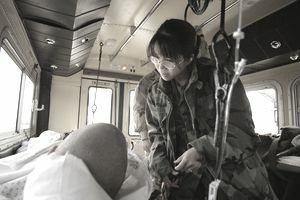 In addition to the obvious needs for nurses who have training in critical care and trauma, Air Force nurses are needed in the operating room, the delivery room and on the battlefield. Nurse anesthetists, pediatric nurses and certified nurse midwives all have a role as well, even though these might not seem like obvious positions for nurses in the military. And nurses who specialize in mental health issues are increasingly important to the Air Force (and other branches of the military), especially in combat situations. And of course, the Air Force needs nurses trained for in-flight specialization. These nurses complete a flying class medical examination and learn about how altitude can affect therapies like anesthesia and other treatments. What Is Air Force Security Forces Training?